"Buddy!" Dylan McQueen announced as he entered the kitchen from the driveway. His teenage son, Michael or Buddy as he is affectionately known, was eating a bowl of cereal and reading a comic book at the kitchen table. Janelle, Dylan's wife, was in another room preparing for her sorority meeting. Releasing a smile when Dylan entered the kitchen, Michael said, "Hey, Dad!" "Where is your Mom? And how was your day?" Dylan asked, taking a seat in front of Michael. He removed his shoes underneath the table. "Mom is in the den getting ready for her sorority meeting. And my day didn't go so well," replied Michael, looking up from his comic book. "Why? What happened?" Dylan asked with great concern. Taking a deep breath, Michael replied, "For starters, I didn't get a good grade on the xylophone that you help me make." "What?! We spent two weeks making that thing! What grade did you get?" Dylan asked as he removed his socks. He was becoming a little disappointed. "I got a ninety-seven out of one-hundred." "That's good, Buddy. It's still an "A," Dylan stated with a touch of relief. "I know right, but I wanted a hundred on that project." Placing another spoonful of cereal in his mouth, Michael replied, "Well, I forgot what makes the sound. And I screwed up the song that I was supposed to play." 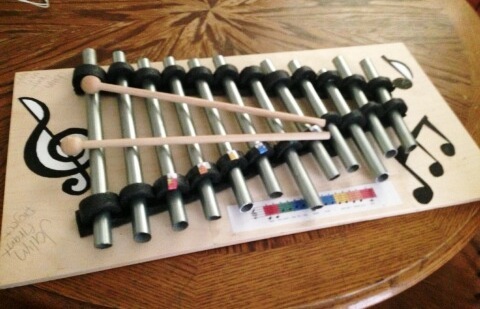 "You hit the bars with the mallet to produce the sound. The harder you hit the bars the louder the sound. See, you weren't even listening when I explained this to you last week. How did you screw up, "Twinkle, Twinkle, Little Star?" It only has a few notes," Dylan asked. "Actually, I was the last to make my presentation, and everyone had already planned to play, "Twinkle, Twinkle, Little Star" or either, "Mary Had A Little Lamb." So, I decided to play something different," Michael replied as he gauged his father's expression. "'Tchaikovsky's Swan Lake.' Needless to say, I forgot most of the notes. So, that's why I got a ninety-seven instead of one-hundred. Anyway, Miss Pembroke loved the xylophone. You live and you learn." Holding back a laugh, Dylan stated, "I just don't know what to say. I'm speechless." "I have one more thing to tell you," Michael announced. "I'm afraid to ask. What is it?" "I've signed up to take xylophone lessons after school on Mondays. You can pick me up after you get off from work and on your way to your pick-up basketball game. I can hang out at the gym until your game is over. See, I made it real convenient for you and didn't schedule it on your poker night," Michael stated as he lifted his cereal bowl to his mouth to slurp the last drops of milk.